This book offers a concise introduction to the Old Testament for undergraduates, students on diocesan ministry courses, study groups and the general reader. 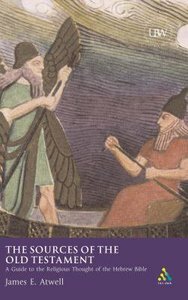 James Atwell explains the main ideas to be found in the Old Testament in their own context, interpreting them in the light of the religious and cultural background of the Ancient Near East from where they emerged. One major aspect of this world of ideas examined by Atwell, and which is of particular contemporary interest, is the significance of creation and the Creator - the topic which formed the broad horizon of biblical theology, which raised so many of the big questions that are grappled with in the Old Testament, including problems of nature and the environment, respect for creation, the distinction between Creator and creature, and human destiny. Each section ends with a list of questions linking the ideas to be found in the Old Testament to modern concerns. About "Sources of the Old Testament"
Atwell studied at Oxford and Harvard and is Dean of St. Edmundsbury Cathedral, Suffolk.